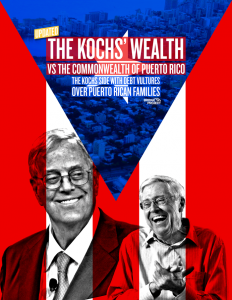 Included are descriptions of the various Koch-backed front groups that have tried to delay and block solutions to help Puerto Ricans, resulting in forced school closures and American citizens in Puerto Rico being cut off from health and public services. It also lists the hedge fund investors who are associated with the Koch network that have exploited the financial crisis for profit gain, and have the most to gain or lose depending on what Congress ends up doing. Will Congress help Puerto Ricans turnaround their economy or will the billionaires in the Koch network force them to hold out to help their bottom line?